OPINION: On JUN 22, 2012 | The views expressed in this opinion piece do not necessarily reflect the views of Animals Australia. An investigation into duck farming by ABC TV's 7.30 that aired on Tuesday night further highlights the entrenched cruelty in factory farming practices and the need for greater transparency for consumers. With Australia's largest producer, Pepe's Ducks, facing allegations of animal cruelty and deceptive advertising, consumers should be aware that suffering is inherent in the wider duck industry. According to the Poultry Co-operative Research Centre, more than 8 million ducks are slaughtered each year in Australia. Pepe's is one of two companies dominating the industry with about 70,000 kills a week. As demand for duck meat rises, producers are under pressure to yield more meat in less time. Sadly, the growing industry is following the lead of chicken factory farms, with thousands of ducks now permanently confined inside sheds with minimal room. This is an unnatural environment for these mostly aquatic birds and the results are devastating for their welfare. Few farmed ducks in Australia have access to open water to fulfil their natural behaviours. Ducks use water to clean themselves and, without it, their eyes and nostrils can become irritated and painful. Furthermore, due to the rapid growth of their muscles in the factory farmed process, their legs are ill-equipped to carry their weight during their short lives standing on hard floors, resulting in lameness and painful disability. While these conditions would shock a conscientious consumer, such cruelty is ingrained in the industry through the government Code of Practice that guides its management. The code governing the farming of ducks allows for up to five fully grown birds or 50 ducklings to be crowded into every square metre. What's more, the code fails to mention ducks' need for surface water. As a growing industry, this oversight needs to be addressed immediately to specifically consider the behavioural and welfare needs of ducks. While the code does include some meagre animal protections, these are guidelines only, so no duck farmer is legally bound to follow its standards. 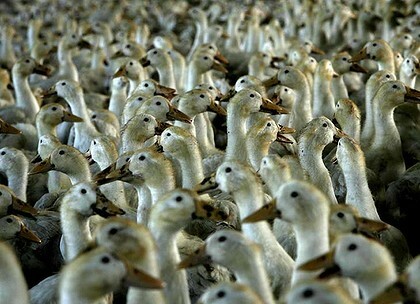 This generally means that a farmer is free to overcrowd a shed with as many ducks as he or she wishes to make a profit. Voiceless is working to lift the veil of secrecy around factory farming, supporting and funding research under way by fellow organisations Animal Liberation and the Public Interest Law Clearing House (PILCH), which are investigating the Australian duck industry and the deprivation of water for intensively farmed ducks raised for meat. A recent Voiceless survey of 1000 randomly selected Australians over a wide demographic showed that consumers reject this style of factory farming. The results showed that a significant 83 per cent support laws to ensure that food animals have access to the outdoors and enough space and natural materials to carry out their natural behaviours. Clearly, by allowing operators such as Pepe's Ducks to continue practices, which in our view are cruel, legislators are failing to meet consumers' expectations. The inadequate labelling of duck products is also troubling as consumers have the right to choose and be fully informed of where their meat comes from. Late last year, Animal Liberation, in conjunction with Pro Bono Animal Law Service (PALS) at PILCH, submitted a complaint to the ACCC claiming Pepe's Ducks' advertising was misleading, which the consumer watchdog is now investigating. Animal Liberation's campaign manager Emma Hurst said the labelling of Pepe's Ducks was misleading by its use of the terms "open range ducks" and "grown nature's way" on its packaging, together with images of a duck located adjacent to a pond, outdoors. Yet footage sent to Animal Liberation from one of Pepe's Ducks supplier farms shows intensive farming practices being used with ducks appearing to have no outdoor access or availability of surface water. These are questions that demand to be answered. Consumers deserve to know fully and truthfully what is happening to these ducks. Ducks deserve to live their lives without constant suffering while in captivity, protected by our government and stronger enforceable laws, not mere guidelines. Dana Campbell is the chief executive officer of animal protection organisation Voiceless.